Wild: I’m not sure why, but the giant scorpions I’ve seen on the island are far more disturbing than most of the Dinosaurs. Rather than simply kill its prey, Pulmonoscorpius gigantus injects its victims with a tranquilizing poison, then eats its unconscious prey alive. Domesticated: Trying to tame a monster like Pulmonoscorpius gigantus sounds like a crazy idea, but I suppose the ability to knock out a foe could come in handy. It could certainly make incapacitating some of the island’s other creatures much easier. 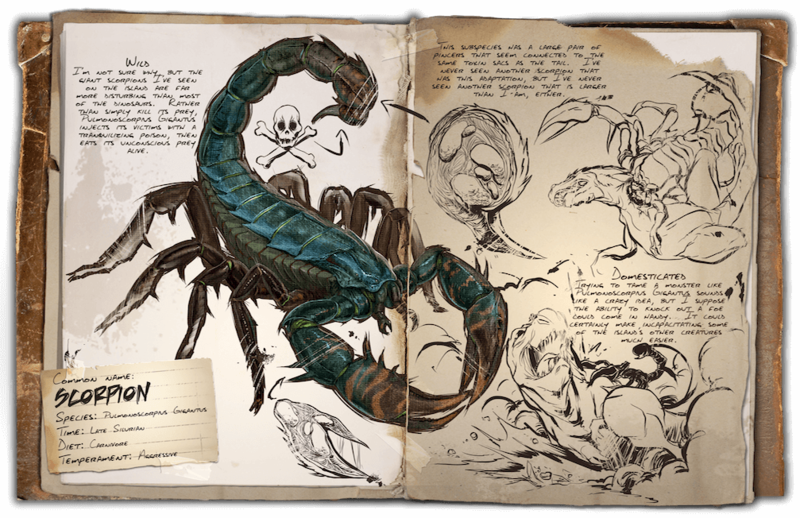 Known Information: This subspecies has a large pair of pincers that seem connected to the same toxin sacs as the tail. I’ve never seen another scorpion that has this adaptation, but I’ve never seen another scorpion that is larger than I am, either.